Exhibit your outfit coordination chops by pairing a MICHAEL Michael Kors Michl Michl Kors Buckle Tab Cowl Neck Sweater and black skinny jeans for a casual combination. And if you want to immediately level up your look with a pair of shoes, why not throw a pair of black leather ankle boots in the mix? A MICHAEL Michael Kors Michl Michl Kors Buckle Tab Cowl Neck Sweater from Nordstrom and black ripped skinny jeans have become an essential casual combo for many style-savvy women. Bring a hint of sultry class to this ensemble by rounding off with black and tan suede pumps. 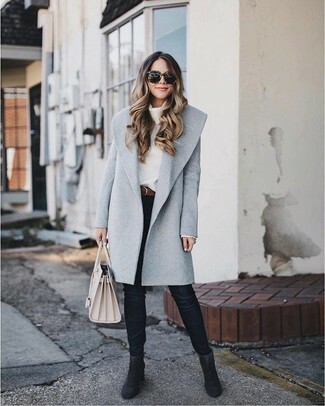 Opt for a MICHAEL Michael Kors Michl Michl Kors Buckle Tab Cowl Neck Sweater from Nordstrom and light blue ripped skinny jeans for both chic and easy-to-style ensemble. 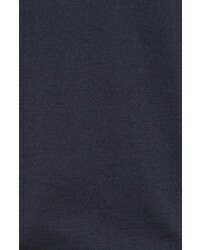 A MICHAEL Michael Kors Michl Michl Kors Buckle Tab Cowl Neck Sweater from Nordstrom and blue flare jeans are indispensable pieces, without which no closet would be complete. Demonstrate your style-savvy side by wearing a MICHAEL Michael Kors Michl Michl Kors Buckle Tab Cowl Neck Sweater and black leather skinny pants. Shake up this ensemble with a sleeker kind of footwear, like these grey snake leather ankle boots. 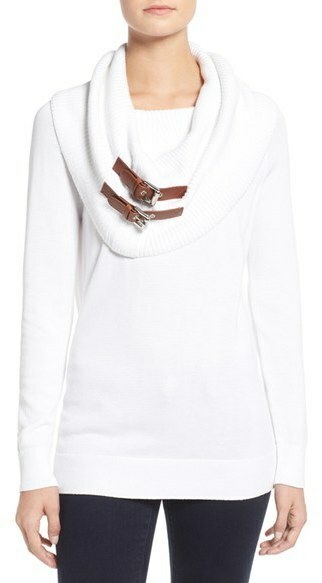 Consider pairing a white cowl-neck sweater with black leggings for a casual getup. Complement your look with black suede ankle boots to instantly change up the outfit. 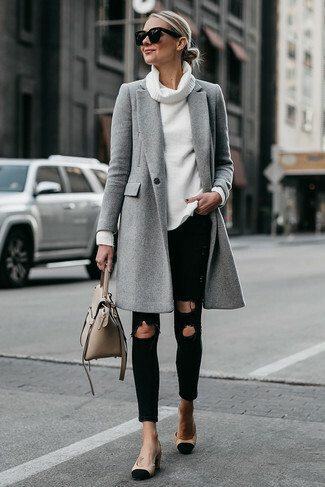 For effortless style without the need to sacrifice on practicality, we like this combination of a MICHAEL Michael Kors white cowl-neck sweater and black skinny jeans. Black suede ankle boots will take this ensemble down a more glamorous path. 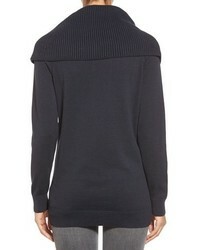 For an outfit that's very straightforward but can be flaunted in a variety of different ways, dress in a MICHAEL Michael Kors Michl Michl Kors Buckle Tab Cowl Neck Sweater from Nordstrom and a black denim button skirt. Finish off with black suede over the knee boots to transform your outfit. 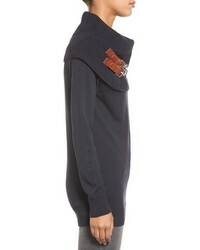 For comfort dressing with a modern twist, marry a MICHAEL Michael Kors Michl Michl Kors Buckle Tab Cowl Neck Sweater from Nordstrom with black skinny pants.